God isn’t finished with you yet. 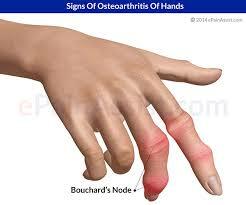 All of this in spite of living with rheumatoid arthritis since she was 29 years old. Two weeks after retiring as a well-known and beloved teacher, she suffered the first of four strokes that robbed her of her memory, weakened her eyesight and left her even more crippled. Anne felt frustrated and useless, unable to do the things she loved. Now she had to depend on others rather than being of help to others. In spite of her limitations, Anne is always at church – worship services, bible studies, and pot lucks. She still offers to cook for different occasions, saying every time, “It’s not very good.” But it is. Everything she makes is wonderful. Even more wonderful is her sweet, chipper spirit. The ladies in our assembly love to hear Anne’s cheery, “Well hello, pretty lady,” never caring it’s Anne’s way of compensating for her poor vision and memory lapse. Then our church put out a call for cookie donations to give to a campus ministry outreach. Having asked for cookies that would freeze well, I was a bit dismayed when Anne’s contribution came in—two cardboard bakery boxes filled with meticulously iced cookies. I didn’t even want to think about the time and pain it cost those sweet gnarled hands to make and decorate those beautiful sugar cookies. I apologized to Barry, the campus house director. “I told the ladies to bring cookies that would freeze,” I told him. “I’m not sure iced cookies will freeze very well.” Barry, who believes any gift has a purpose, grinned. “They’ll get used,” he promised. 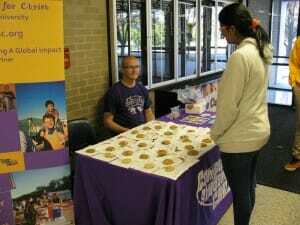 The campus ministry had arranged to set up a table in a different campus building every day of one week. As students passed by, volunteers called out, “Free cookies, come get a free cookie!” Some would hurry by, others grabbed one to go, and yet others stopped to question. Are they really for free? Who are you guys anyway? Barry was right. And so was Anne. Of course Anne was right. Hadn’t she spent years decorating cookies? Those cookies froze just fine. 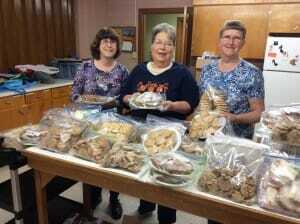 In fact, Barry told me, Anne’s iced sugar cookies were the biggest hit the Tuesday of the cookie drive. My imagination is hitting overdrive. 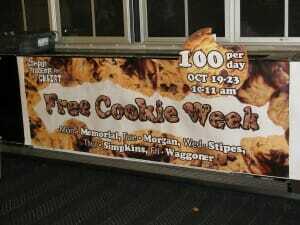 Wouldn’t it be totally awesome if that student came to a defining relationship with Jesus Christ because of a cookie? Because of an iced cookie. An iced cookie that a lady who thinks she has nothing more to offer made with gnarled, pain-ridden hands. God can and will use anything. And if we ever, ever wonder why God is allowing us to stay on this earth in a pain filled useless body with a mind that is losing its grip on the memories, it’s because He still wants to use us to shout His glory to the nations. He still has work for use to do. He isn’t finished with us yet. Even if it’s through one iced sugar cookie. Oh my goodness, I didn’t know all that backstory. She is one awesome lady! Thank you for sharing the impact Anne has had on your life. Anne is such a great reminder that it isn’t what we do so much as what we are. And she shines Jesus through every pore!